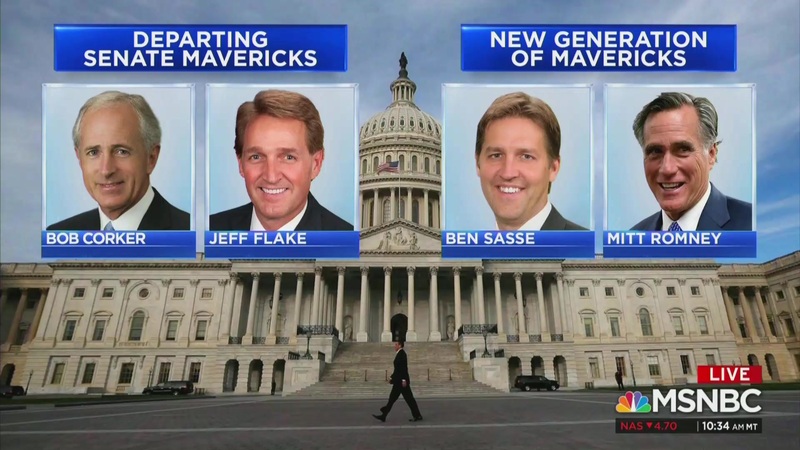 The on-air graphic also called retiring Senators Bob Corker and Jeff Flake "departing mavericks"
Speaking to former John McCain adviser Mike Murphy Wednesday afternoon, MSNBC anchor Andrea Mitchell asked him if he was surprised to see this “new maverick shift” coming from Romney. The two then talked about which GOP senators would be willing to stand up to President Trump now that critics such as McCain, Jeff Flake, and Bob Corker are no longer in the Senate. Well, it didn’t take long for MSNBC to take heat for describing milquetoast conservatives as “mavericks,” especially from liberals and progressives. HuffPost’s Yashar Ali wanted to know who was responsible for the graphic. Gizmodo’s Tom McKay put together some parody versions of MSNBC’s graphic, some of which were truly inspired. You can watch the full clip of Mitchell’s interview with Murphy above, via MSNBC.